Syllabus of the Online Course (Subject): Association Agreement between the European Union and Ukraine. Learning materials in or Unión Europea-Ucrania Union européenne-Ukraine União Europeia-Ucrânia. The EU-Ukraine Association Agreement entered into force in January 2016. The first chapter aims to eliminate customs duties on imports and exports. The vast majority of customs duties on goods will be eliminated as soon as the agreement enters into force. 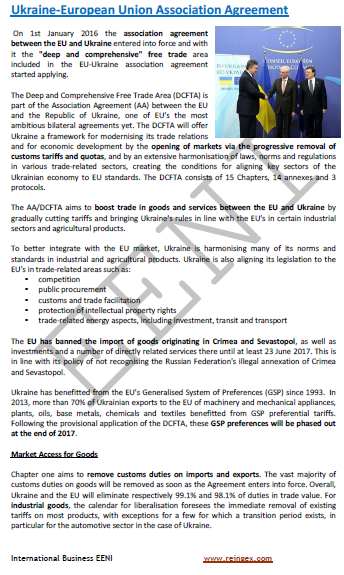 In general, Ukraine and the EU will respectively eliminate 99.1% and 98.1% of customs duties on trade value. In the case of industrial goods, the liberalisation schedule provides the immediate abolition of tariffs on most products, with some exceptions for a transitional period, in particular for the automotive sector in the case of Ukraine. The European Union-Ukraine Association Agreement belongs to the European Economic Area (Western Civilisation) and the Economic Area of Orthodox Civilisation.